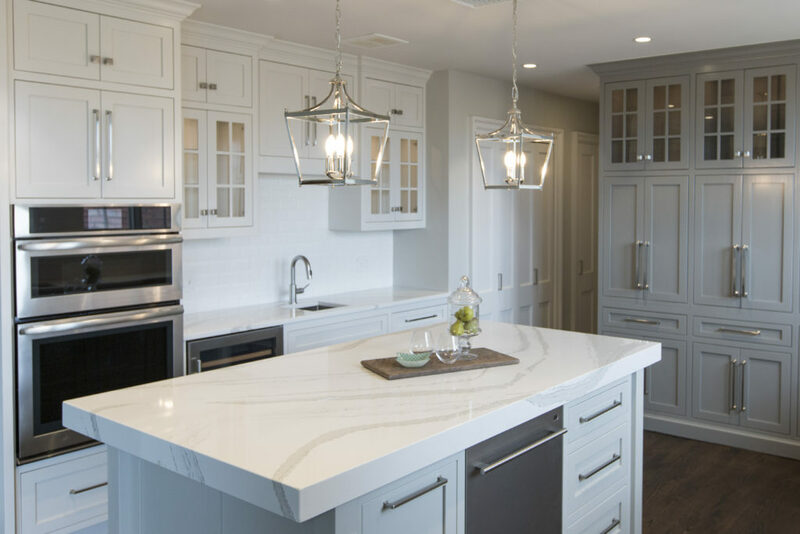 White Quartz Counter tops – Even though darker kitchens are making appearances across the U.S. and especially on the coasts, white quartz counters still dominate with interior design clients as the most popular material here in the United States. As an interior designer I’ve worked with over 1200 clients and believe wholeheartedly the reason for this appeal is because white reflected back onto our skin makes us look and feel younger. White also feels fresh after years of darker colors plus marble style patterns are classic and timeless. Here in this kitchen the island counter has been designed with a mitered edge (thick) which is another huge kitchen remodel trend that gives a more luxurious feel and wow factor. 2. Counter Depth Refrigerator Here in this kitchen space a counter depth fridge creates a wider walkway through the kitchen to the garage and other rooms behind. Other trendy features include reflective tile back splash, and lit glass cabinets. 3. Touch Faucet – Touch faucets are gaining popularity because you only need to touch the faucet with a part of your body to activate or deactivate the flow of water at a preset temperature. 4. Steam Convection Oven – Who doesn’t love an oven that can cook food in half the time at a lower temperature plus keep foods moister and brown bread. What qualifications/experience do you have with my type of project and can you provide references? For example ask if the contractor belongs to NARI, National Association of Remodelers or HBA, Home Building Association. 2. Can your insurance company mail a current copy of your insurance policy(s) before we sign the contract? Contractors should have liability insurance to cover any damage to your property and workman’s comp for anyone working on your home to protect you if they get hurt on the job. 3. How do you charge? Normally remodelers give a bid/estimate of total amount for project minus any unseen issues or simply charge for time (hourly) and materials (products). If you want to buy materials yourself and just pay the contractor for your time, make sure they offer that option and that you can put a limit on the hours billed so project doesn’t get out of hand. 4. Can you complete work within my requirements and may I have a timeline/schedule of construction beforehand? 5. Will you provide a signed contract with scope of work to be done and warranty? Color, the biggest issue faced by homeowners starting an interior design or interior decorating project is often an overwhelming task so I’ve broken it down into three manageable steps for you today. 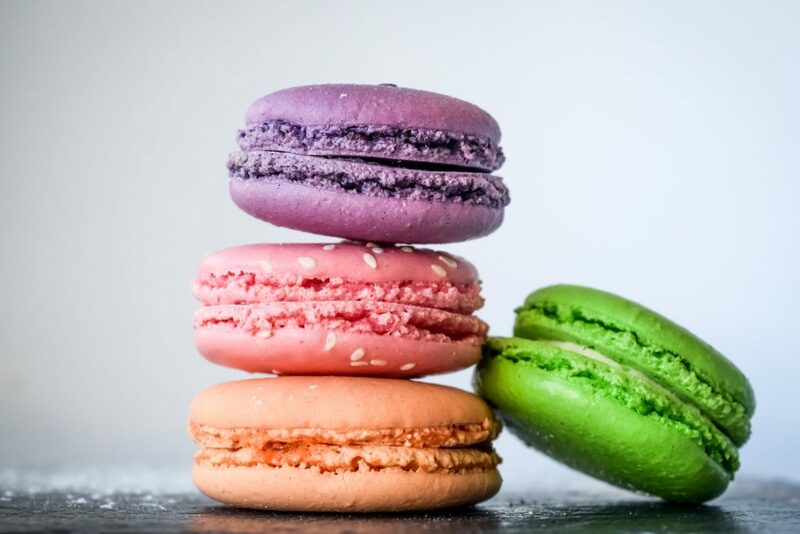 View colors on a white background – First and foremost, when selecting colors, make sure that you’re viewing colors on a white background to get a true sense of the colors before placing them on a wall. Don’t wear colors that might reflect back on those paint colors while you’re making selections because red, for example, could reflect back on another color giving it a green cast. 2. 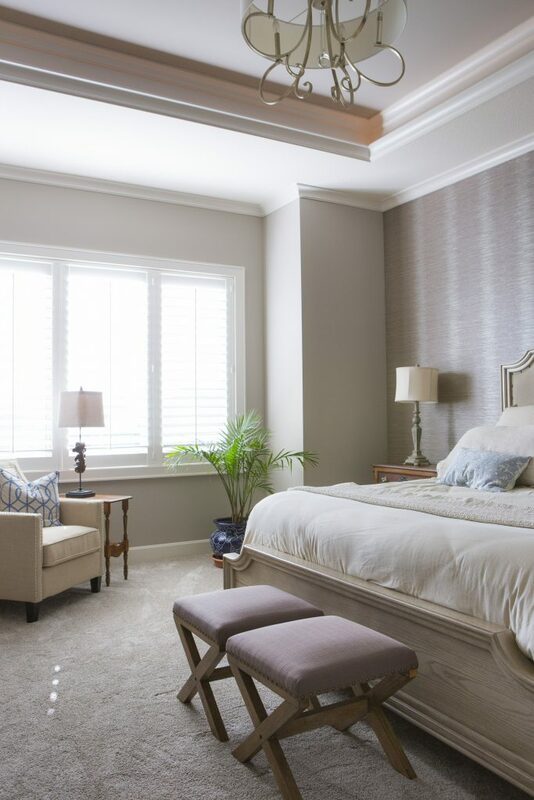 Make color selections during daylight – Consider natural light along with artificial light in the room. For trim and ceiling paint colors, look to the lightest end of your paint strip for possibilities along with whites. 3. Paint large swatches of your paint selection on a backed poster board – All too often I walk in as an interior designer and see clients who’ve painted a light neutral over another color on the wall and the original color is bleeding through or distorting the hue. Once you have the board painted, place against a neutral white background view during both daylight and after dark to ensure you still like it. If you don’t know where to start with color, pull inspiration from a favorite item like artwork, a rug, fabric, jewelry or even nature and let the fun begin! plus become a fan of Kansas City’s interior designer and former host of Living Large, Karen Mills on Facebookhere! Who doesn’t love this time of year – warmer weather, food on the grill, and great parties outdoors! But when it comes to outdoor gathering often our outdoor space need a little sprucing up. 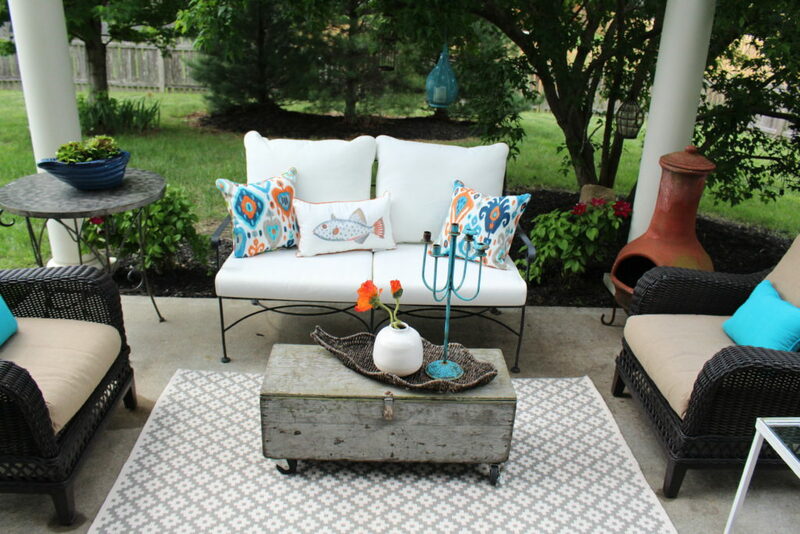 Here are 3 tips for adding a little pizzazz to your outdoor room. Texture in a space is critical – it softens the hard surfaces and creates interest. 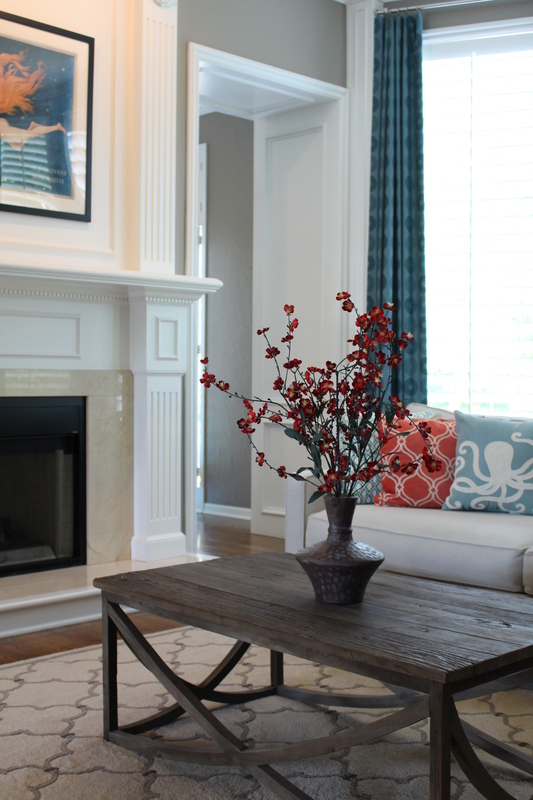 In this photo the large blue green vase on the hearth adds a pop of color while the branches inside add texture along with the orange flower and napkins. When you’re decorating or designing a space its important to add your own personal touches that show off your personality. 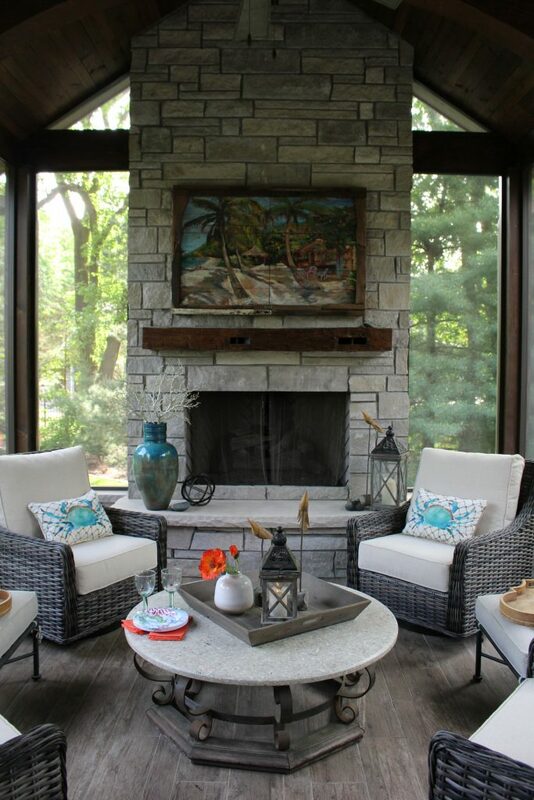 On this covered porch the homeowner had a painting done on wood and picked up an iron table base to give this outdoor room a one of kind look. If you’re like me you’re ready for warmer weather and cheerful colors. Here are 3 ways to make your room feel lighter and happier. One of the easiest ways to add spring hues begin with bright colored pillows. Other simple ideas could include removing dark heavy drapes, adding white cotton slipcovers to your upholstery, or replacing a heavy darker rug with a sisal one. In this room bold patterned pillows create a dramatic contrast against the white sofa and custom blue green drapes beyond while the red orange flowers and artwork add to the tropical look. Nothing says spring like a bouquet of fresh flowers, a beautiful orchid or live plants. 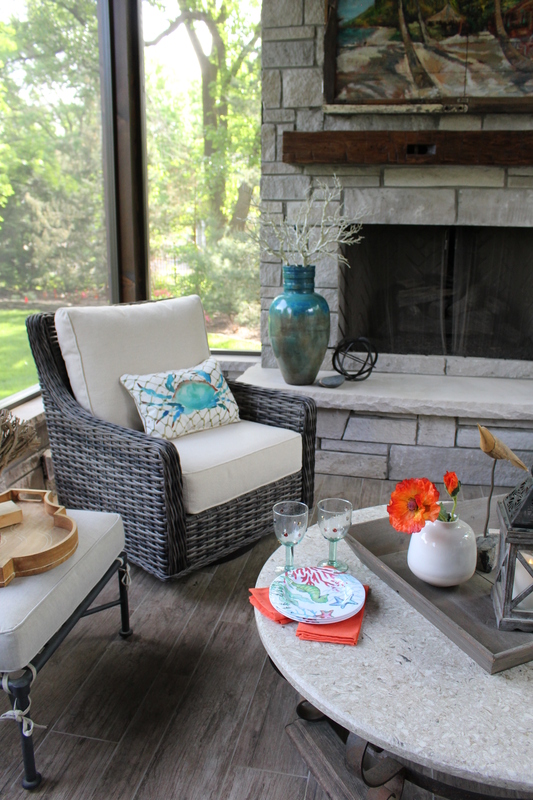 Here in this outdoor living room the orange flowers pick up the color in the napkins, creating a cheerful spring look. 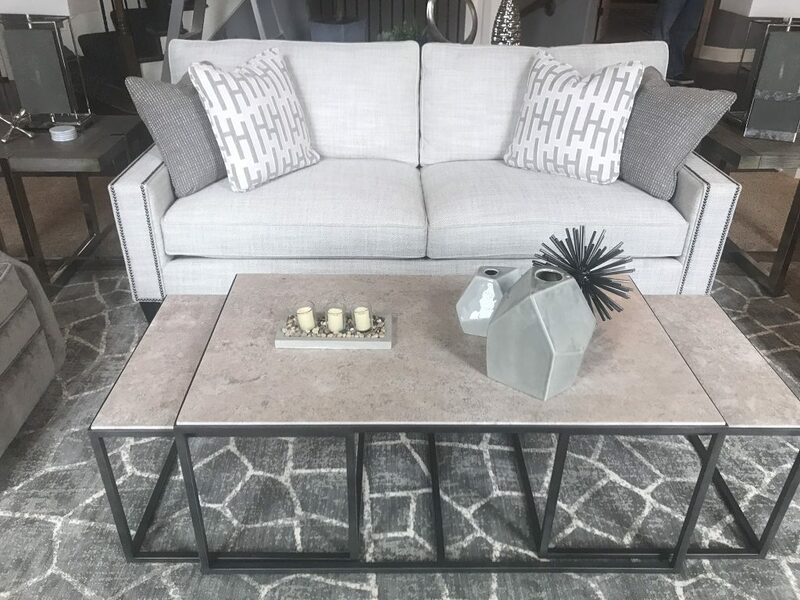 If you have a lighter area rug like the one pictured here that you can swap out for a darker one, the entire room can be transformed from winter to spring. White coral and a rope glass lantern with a blue candle enhance the spring/summer feel along with the light airy pillows and fresh plant beyond. plus become a fan of Kansas City’s interior designer and former host of the Living Large design show, Karen Mills, on Facebook here! Like any project that involves money, you need a budget or at least a range before you start. Do some research and bring in the experts – an interior designer, contractor/builder, and/or architect to give an estimated investment. 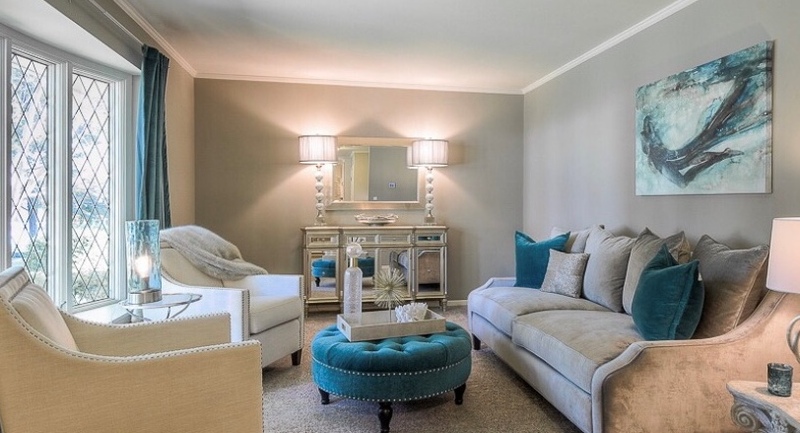 Then follow these 7 steps to create the room of your dreams! 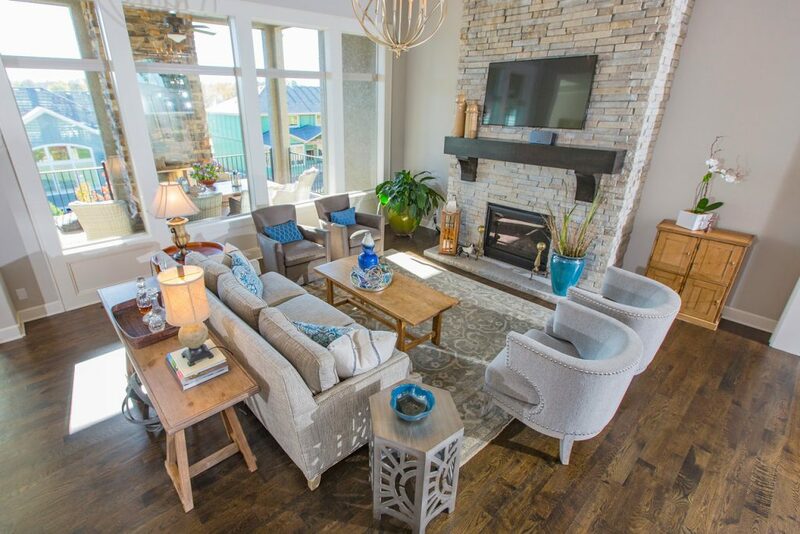 Decide on a design style or mix of styles that will flow with your architecture and existing furnishings you will be re purposing. 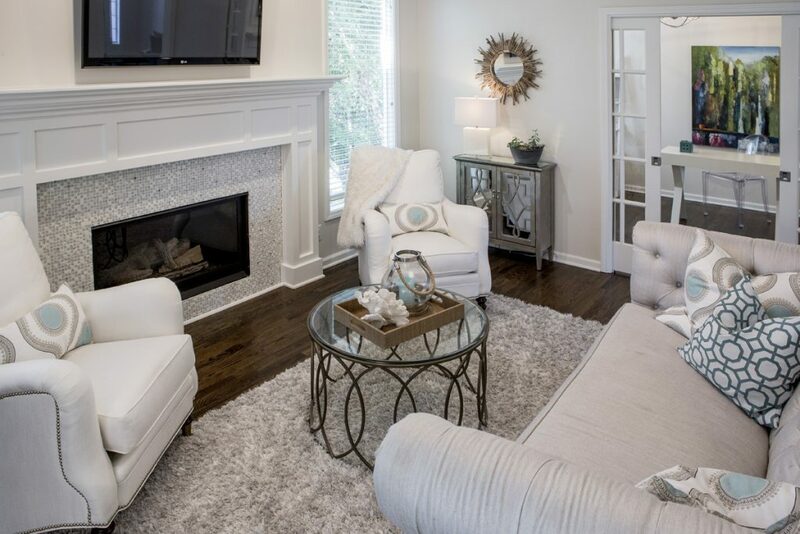 As an interior designer in Kansas City, I always suggest clients select several photos of room designs they like and make sure any spouse or significant other involved agrees. Here in this great room our client wanted a glamorous Hollywood style mixed with touches from the beach in decor and color. 2. Determine your color scheme ensuring it coordinates with adjoining rooms and any existing furnishings to be used in the interior design. If you have no idea, take a look in your closet to see what colors you’re drawn too or pull colors out of an inspiration piece like we did here with the existing artwork. 3. Create a floor plan so you know what fits in your space and the sizes you need. To do that you can go online and use space planning software or get an interior designer to help. In this living room, we created a U shaped seating area to add emphasis to the fireplace which is the main focal point in the room. 4. Set a timetable. 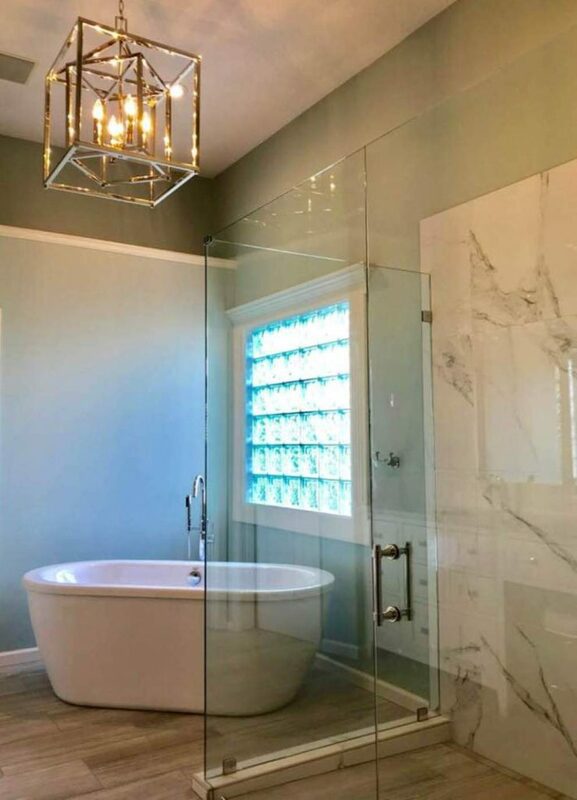 At this point you might want to bring in an expert – interior designer and/or contractor/builder to review your design time frame because investing a few dollars for a master plan and viable timetable can help avoid thousands of dollars in costly mistakes later. 5. Design and order custom furniture and any built in cabinetry after consulting with your interior designer or tradespeople if you’re managing the project yourself. At this point all custom designs need to be finalized and ordered. In addition permits need to be pulled for any construction. In this great room we designed a custom sofa and reupholstered two chairs to perch atop a cozy organic style rug we found. 6. Select and order all plumbing, flooring, tile, and general lighting, if needed. Furnishings may include rugs, window treatments, pillows, bedding or other items. In addition ensure you select art, finishes, and other decor needed. Here we found coordinating pillow fabrics, a rug, tables, lamps, and decor to coordinate the custom sofa we designed. 1. Lack of a Focal Point – Often as an interior designer I walk into a bedroom to discover a stark cold space that has no focus. With interior design a bed becomes the focal point and we need to enhance it. Here in this beautiful inviting bedroom we enhanced this poster bed with crisp white bedding, a fabulous textured leaf wallpaper, and a warm hand knotted wool rug with matching lamps and nightstands flanking it and a bench. 2. 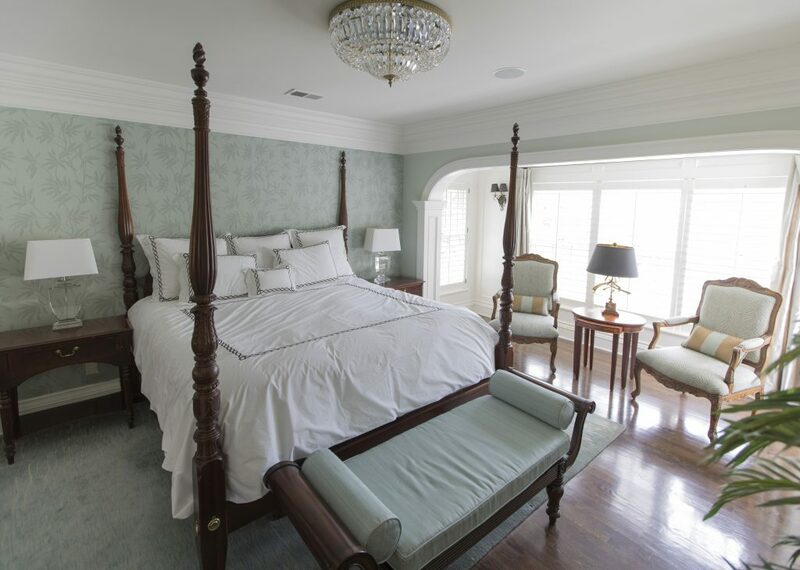 Uninviting – To create a more inviting bedroom with the existing American antiques our interior design firm layered in a upholstered bed with wallpaper behind, an attractive chair, and washable European linens that invite to come jump into bed. 3. 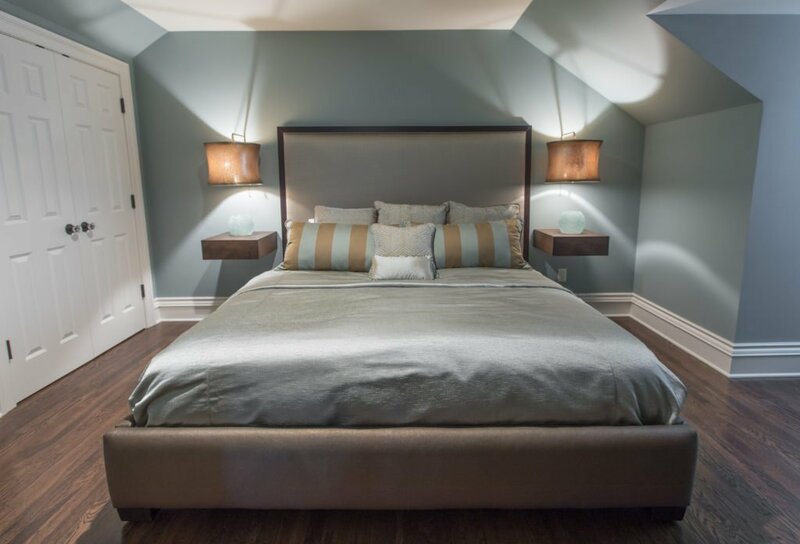 Too Cluttered or Crowded – In this tiny converted attic bedroom we didn’t want the room to feel to crowded or cluttered with this king size bed the clients requested so we designed a bed that didn’t overwhelm the room along with floating bedside tables and lamps that didn’t take up any more room on the floor. The lamps also add an inviting element with their low light. Headboard and custom bedding fabrics in more neutral calming colors help keep the space from feeling too busy. INSTAGRAM, FACEBOOK, TWITTER, or LINKEDIN here! 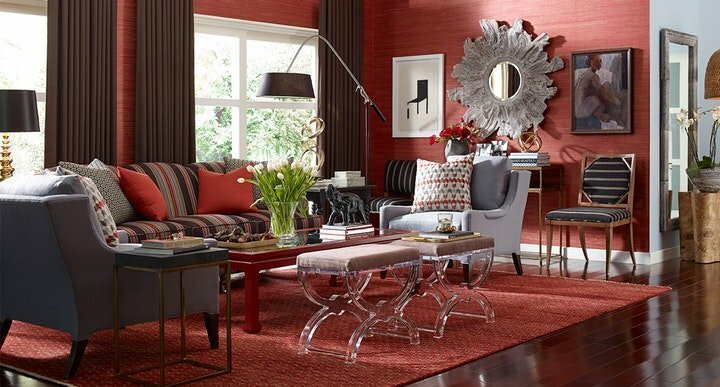 If you haven’t updated your living room for 5 years or more, it may be time for a refresh. If your budget doesn’t allow you to start completely over, why not opt for a one day makeover or refresh instead? Even though the majority of my time as an interior designer is spent on custom design and remodel projects, when I have a spare hour or two I love helping enthusiast homeowners style their space using existing furnishings in their home to create a fresh new look. So if you’re ready to refresh your space or update using existing furnishings, here are my top three tips! 1. 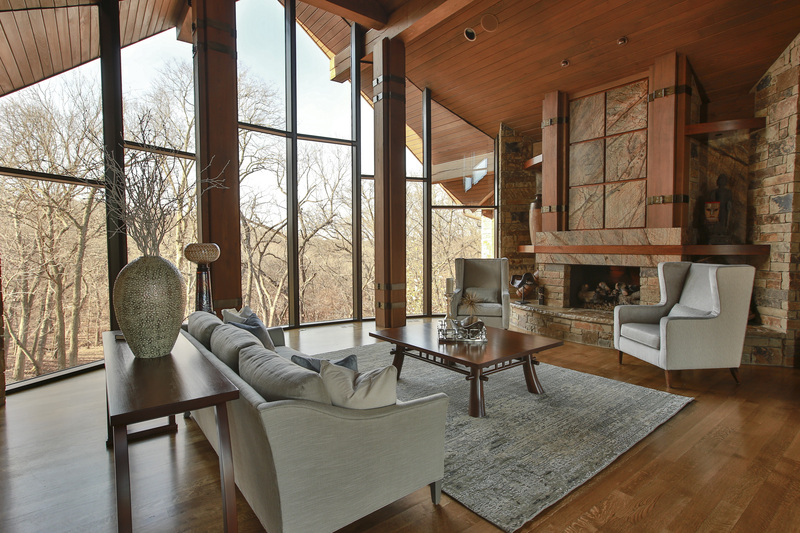 Create an inviting floor plan that emphasizes your focal point whether its a fireplace or view, for example. 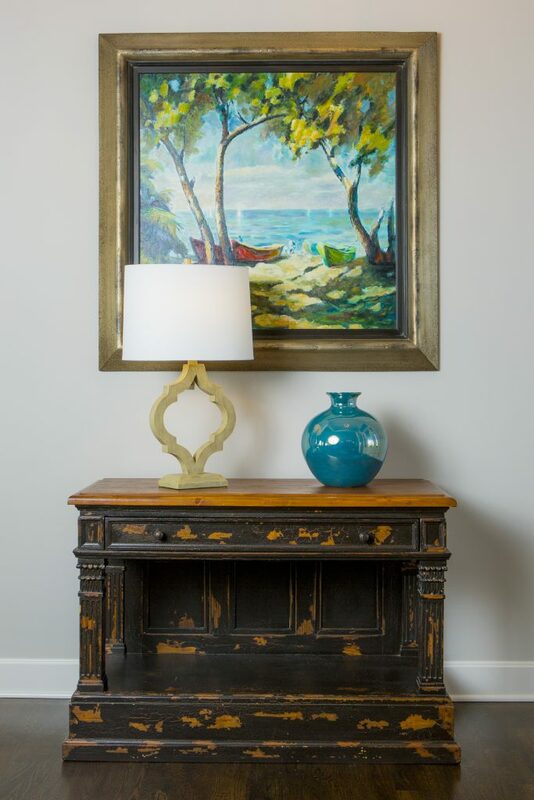 If you don’t have a focal point, design one yourself by grouping items together such as a sofa table or chest with a piece of artwork overhead and a table lamp and/or tabletop decor. 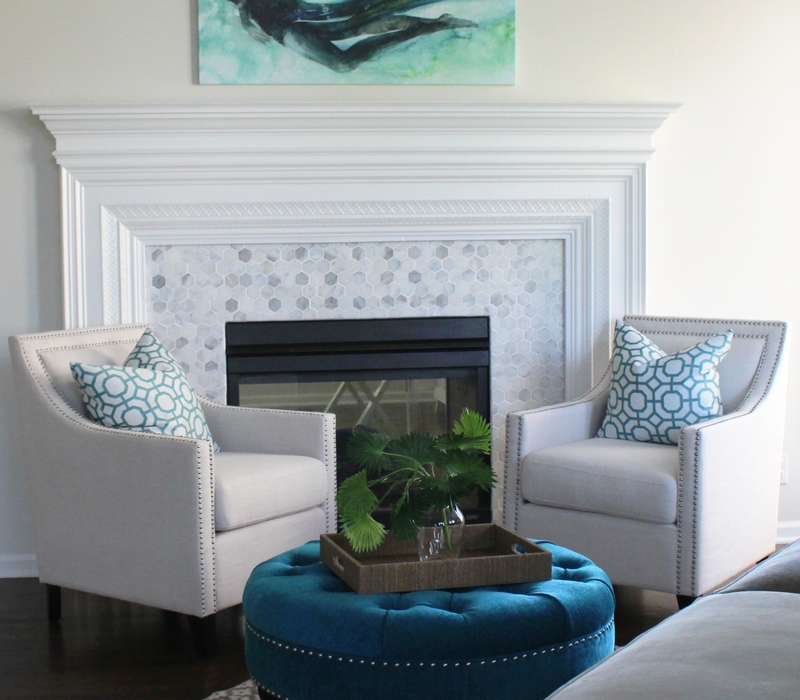 In this room the client started with a favorite piece of art over the mantel and we replaced the fireplace tile along with upholstering the existing chairs and ottoman to create a fabulous new look! 2. Shop your entire house for furniture/furnishings you can use in your room. Keep those items you discover in mind as you start to put together your room, bringing ones you think might work to a staging area nearby. As an interior designer I often re purpose items to make them work in a space such as this family room where we reupholstered the sofa and chairs along with layering in a new rug, repainting the walls, adding a new light fixture, and decor. 3. 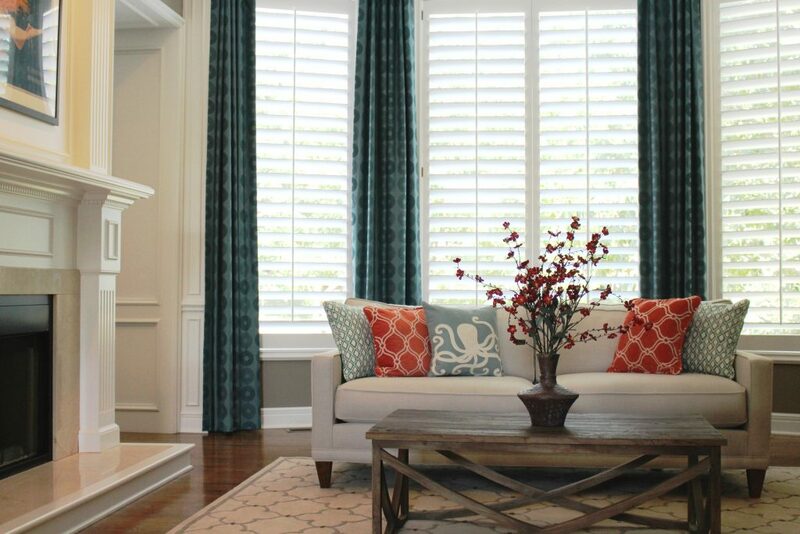 Add a pop of color with accents throughout your room with pillows, art, drapes, decor or an area rug. Remember, you can repaint or re purpose items to use in your refreshed room also. For example, a chest could repainted and moved to your entry, used as a focal point in a living space, or even placed behind a sofa. Ottomans can be upholstered and tucked under a sofa table for extra seating, used as a coffee table or pulled up to a comfy chair. In this fabulous ocean blue living room, we began with existing mermaid art as inspiration, introducing bold blue and orange pillows along with custom blue drapes. Work Area Not Functional – Creating a functional layout is the first step to kitchen design that works whether you’re designing for a new home or doing a kitchen remodel. Here in this interior design client’s kitchen we formed a work area or triangle with the stove, refrigerator, and two sinks that’s easy to use and doesn’t require too much walking. 2. 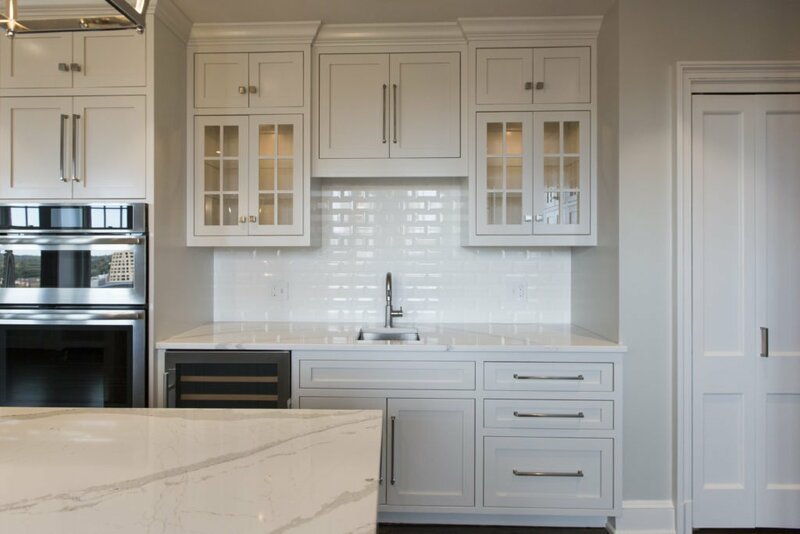 Wasting Potential Storage – Countless storage options exist so there’s no reason to waste space in the kitchen especially with the adaptive kitchen storage units that make drawers and cabinets more functional from trash pullouts to roll out shelves. 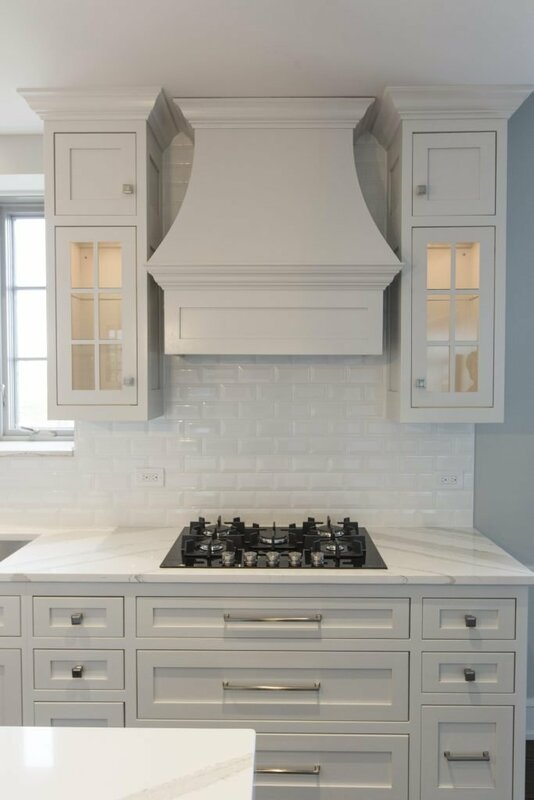 Here in this fabulous historic Walnuts condo where space is at a premium, we added pegged drawers under the stove for pots/lids, hidden pop open storage under the island. and used the extra space we gained straightening out a crooked back wall to create a coffee bar and pantry area that’s also draws you into the space. 3. Work Area Too Crowded- As an interior designer I’ve lost count on how many times I’ve walked into a home that didn’t have enough work space. 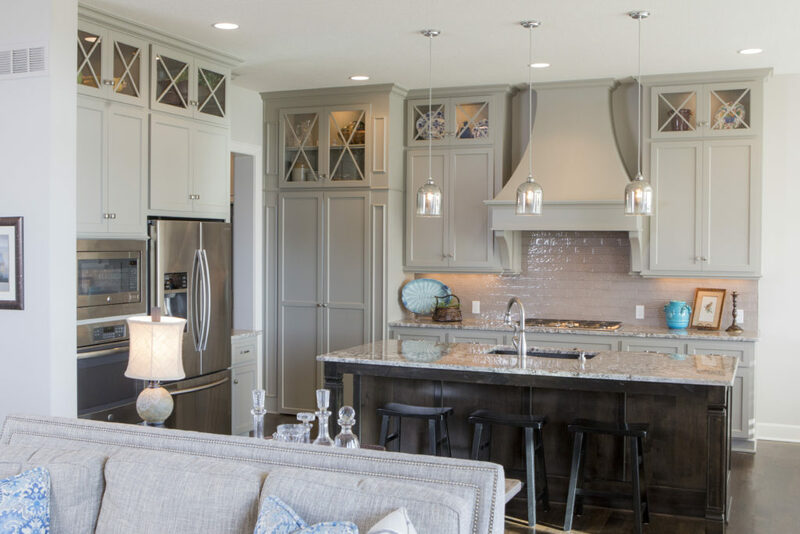 Even though the recommended distance between an island and wall cabinetry is at least 42-48″ usually I find that the minimum required distance of 36″ is often the reality of existing kitchens, resulting in a space that’s too cramped and not functional. Other issues I often encounter with interior design clients are kitchens where drawers or refrigerator doors can’t open to function correctly. Here in this kitchen we widened the walking area and made sure counter space was provided where needed whether to set down groceries or items from the dishwasher or room to simply bake a pie. 4. 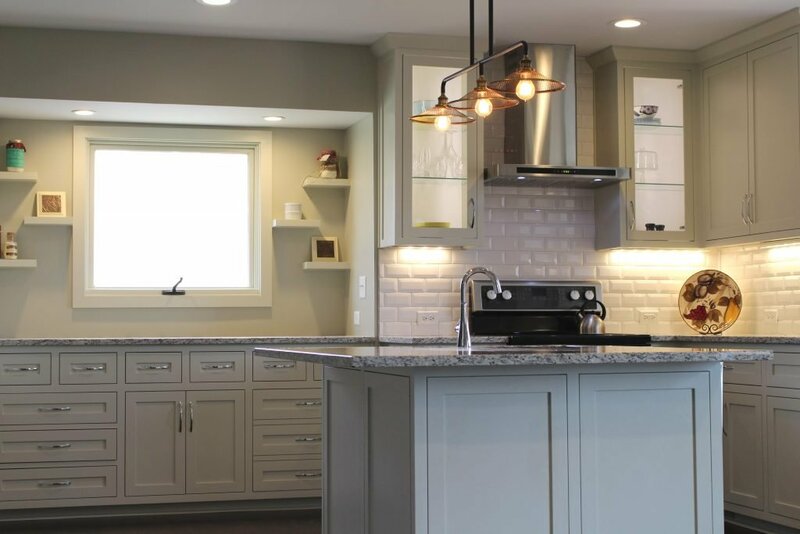 Lack of right lighting – If your new kitchen doesn’t have a mix of general, task, and accent lighting, it will tend to be a little lackluster in appeal and probably function. Here in this kitchen design, I created a kitchen with can lights for general lighting, added puck lights tucked away inside the glass cabinets for accent lighting and interest, plus introduced mini chandeliers over the island that not only provide accent lighting but also task lighting for working in the kitchen. 5. 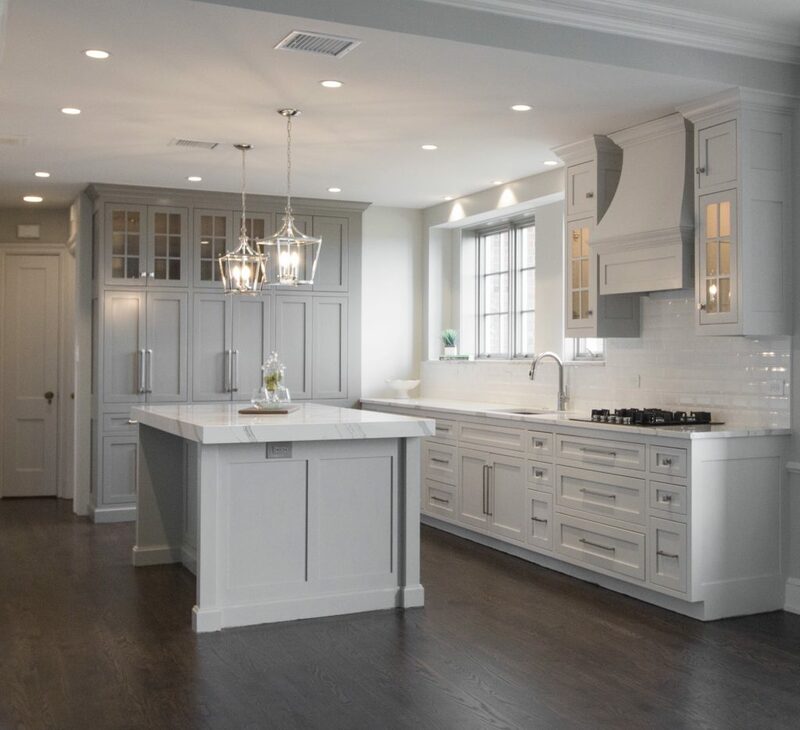 Not bringing in a professional – Hiring a professional kitchen designer with experience who creates kitchens and bathrooms for a living can help you avoid costly mistakes, free up your time, and create the space of your dreams, while ensuring your space is functional. In this kitchen refresh where we reused most of the existing cabinetry, we were able to introduce new elements that created a wow factor – bigger airy light fixtures open shelving, counters that continued up the wall, a mitered edge island counter top, and bold cabinetry colors, to create a fresh new look showed off our client’s creative spirit while ensuring the space would well for them. Lack of emphasis Creating a focal point with your table in the dining room gives you the opportunity to create a dramatic look, perfect for a dinner table or family gathering. 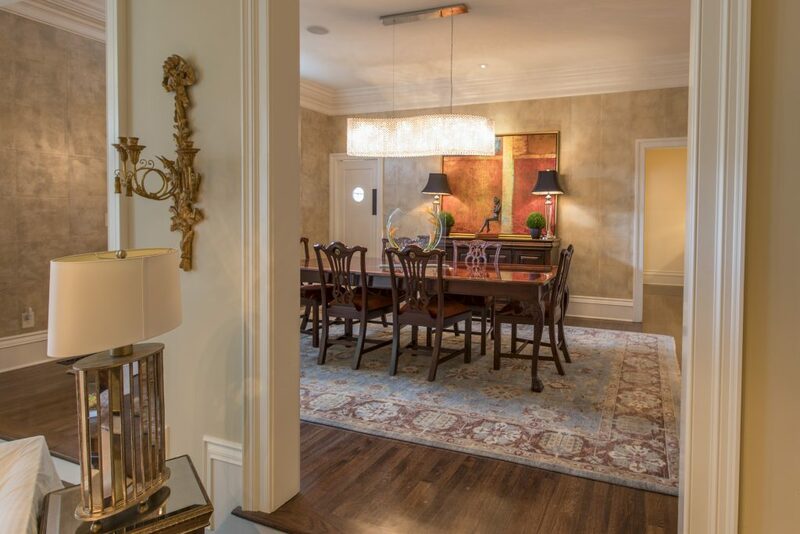 Here in this Mission Hills dining room we began with an existing table and buffet along with selecting a fabulous hand knotted wool rug. Then we took the design to another whole level but introducing more contemporary elements from the stunning Swarovoski crystal chandelier that compels you to take a closer look to the bold abstract art beyond, contemporary sculpture, and rich leather squares on the wall. 2. Cold uninviting space – One of the most common issues I see as an interior designer are dining rooms filled with hard shiny surfaces such as crystal, glass, or ceramic along with nothing on the floor or walls. To rectify this issue, try warming up your dining space with lots of texture. 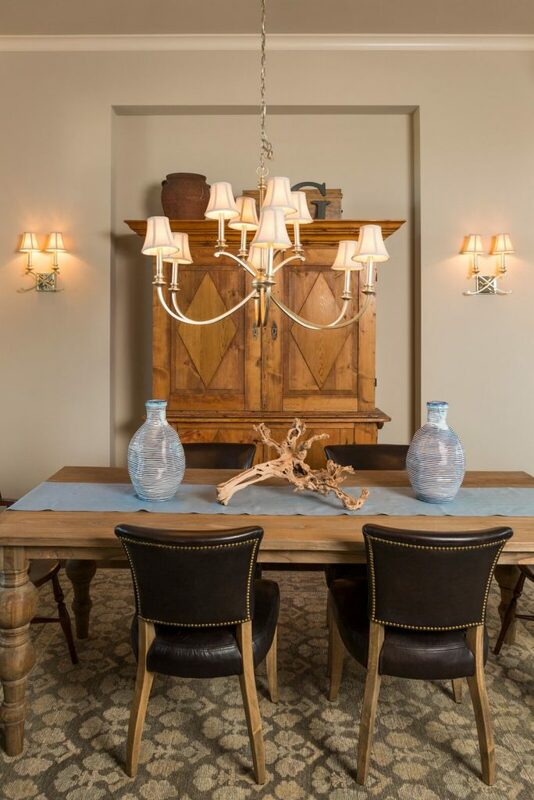 Here in this Overland Park room the client requested we use their heirlooms – a table and armoire, along with leather chairs. To warm up the space, we introduced a piece of gnarled wood, two handmade looking vases, and a custom cloth runner along with layering in a thick hand knotted rug underneath. 3. Looks Unfinished When we walk into an interior design client’s home one of the first things we often see is an undone dining room. To enhance this space and make it more updated, I recommend adding color and items of interest whether with texture or design. 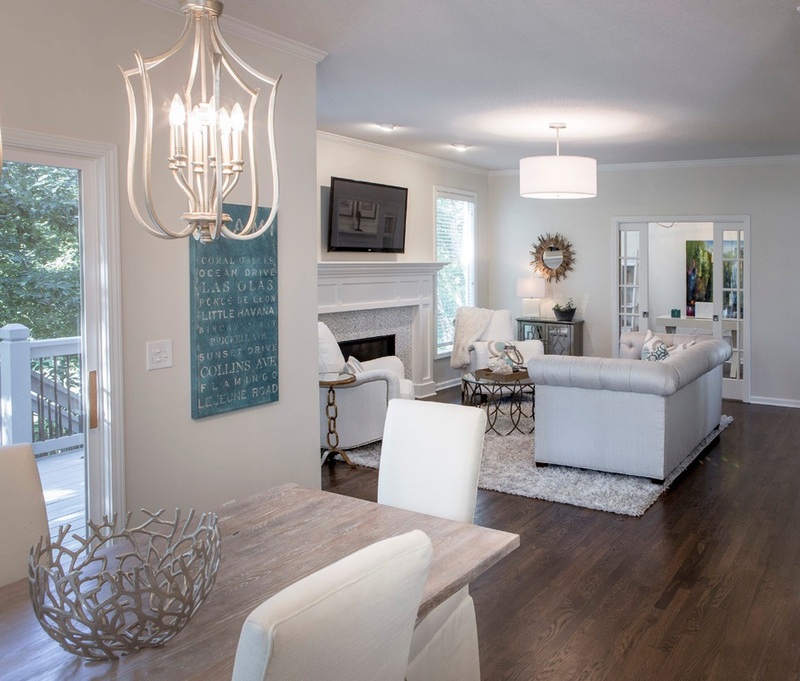 In this dining area, we refinished a door in a soft neutral gray, updated the light fixtures overhead, put slipcovers on plain dark leather chairs, and added an interesting centerpiece along with blue art to create an inviting area to eat and relax.